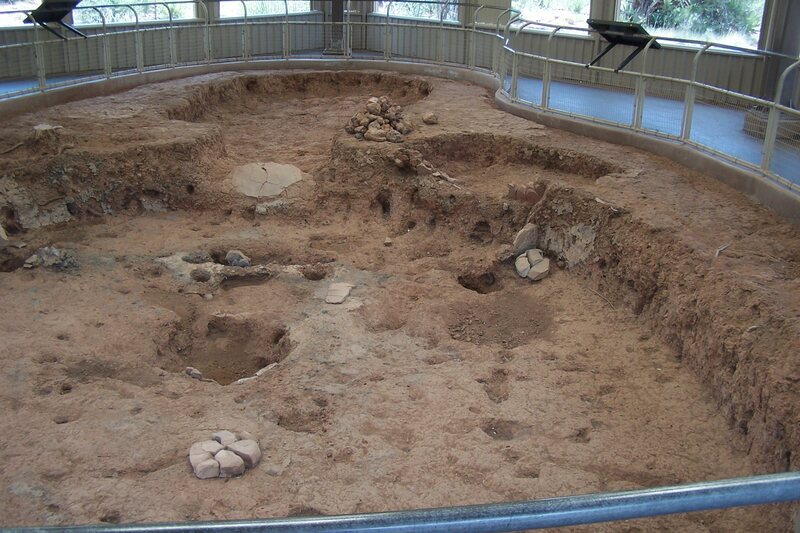 About 1,400 years ago, people living in the Four Corners area decided to move to and and live at Mesa Verde. For over 700 years they called home the mesa tops and the canyons below, building simple structures at first, more elaborate buildings later. 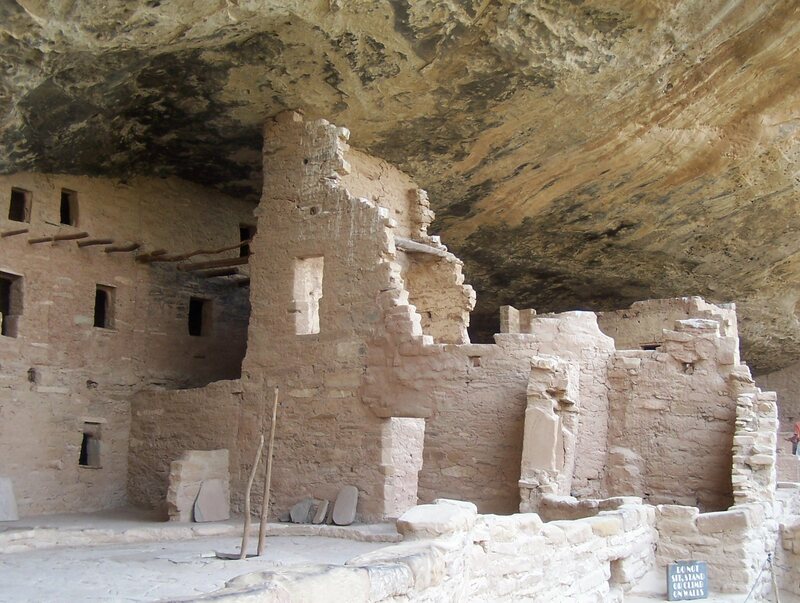 Their construction culminated in the large cliff dwellings that make Mesa Verde famous. Then, shortly after these buildings were done, the people moved away for good. They left behind no written record, and much of their daily life, and most of their motivations and thoughts, are lost for good. Archaelogists and anthropologists have sifted through clues, both old and new, and have tried to explain as best they can how these people lived here, and why and where they went. 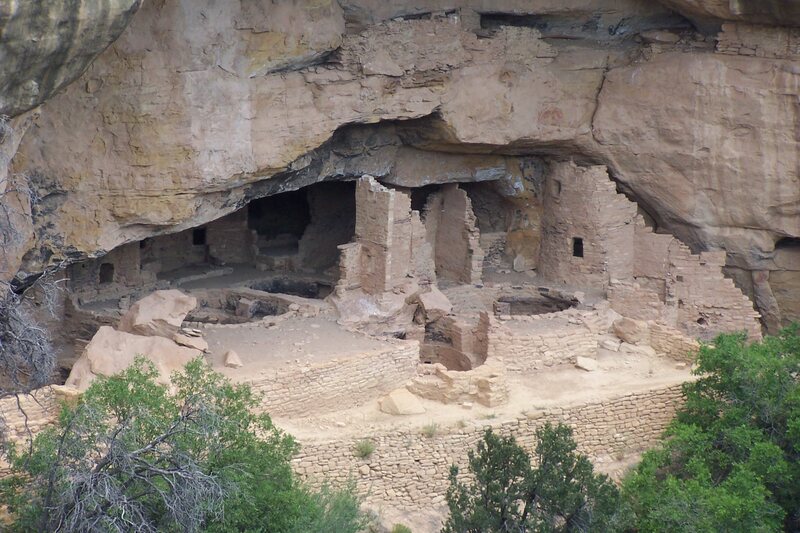 People began living permanently at Mesa Verde around the year 600 A.D., and were gone by the year 1300 A.D. Life was not easy here; the Ancestral Puebloans (The preferred term now, instead of Anasazi) had to work long hours to grow their beans, corn, and squash crops. They also hunted with bows and arros whatever animals might be found nearby, including deer, rabbits and squirrels, and they raised domesticated turkeys. Late summer was a busy time, as they had to gather and store the crops, in order to use them during the long cold winter months, and perhaps even during the next year or two, if drought struck. 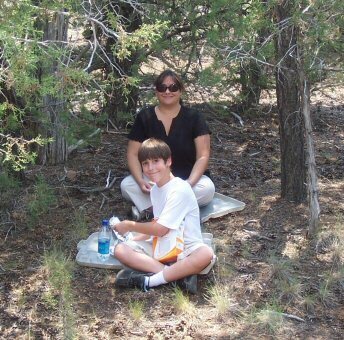 They supplemented their diet with pinon nuts and juniper berries, grinding them up with the corn to make a meal. The architecture left behind by the Ancestral Puebloans is the most distinctive feature of Mesa Verda. The first settlers dug pithouses on the mesa tops, and perhaps built simple shelters under overhanging cliffs. These pithouses, over the centuries, became more sophisticated and perhaps evolved into the kivas of later centuries. By the time of the early 1200's, the settlers began building the elaborate houses in the cliff niches that we see today. Spruce Tree, Long House, Step House, Square Tower House, and Cliff Palace are all examples of this architecture. But by 1300 A.D., the Ancestral Puebloans had left Mesa Verde. Today it is thought that the people moved south, to join their relatives in the Rio Grande Valley in New Mexico, and to the mesas of northeastern Arizona. It is not known for sure why they left; perhaps the soil had grown tired, perhaps the drought of the late 1200's was too severe. Or perhaps they moved for psychological or religious reasons, or some combination of all these. All they left behind are tantalizing clues that intrigue us to this day. 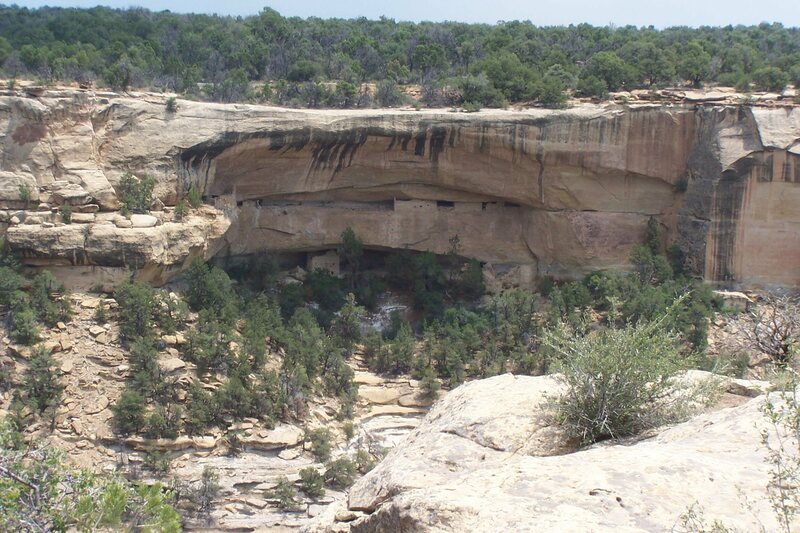 The cliff dwellings are the most interesting part of Mesa Verde. But first, you have to get there. Mesa Verde is in the southwest corner of Colorado, a long drive from most places, but even when you get to the turnoff your journey for a stamp is far from over. It's a fifteen-mile drive along a narrow blacktop road to get to the main visitor center, Far View. There's a good-sized parking lot, which is a good thing. 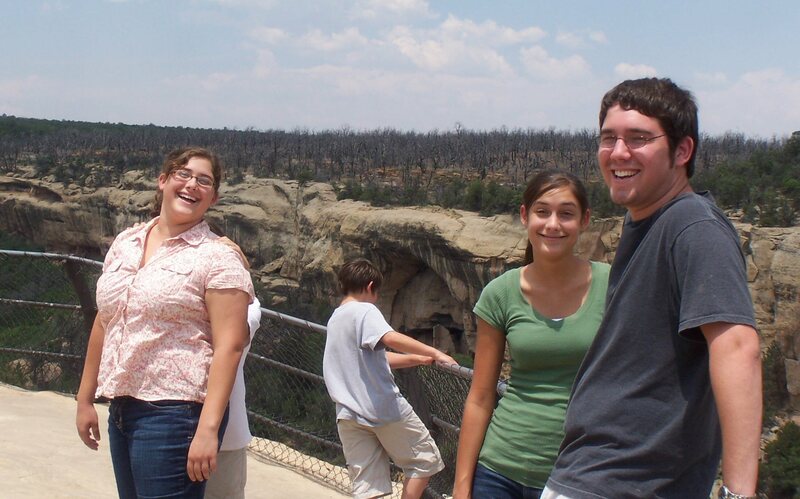 In July we found Mesa Verde to be pretty crowded, and the Far View building was awash with people. 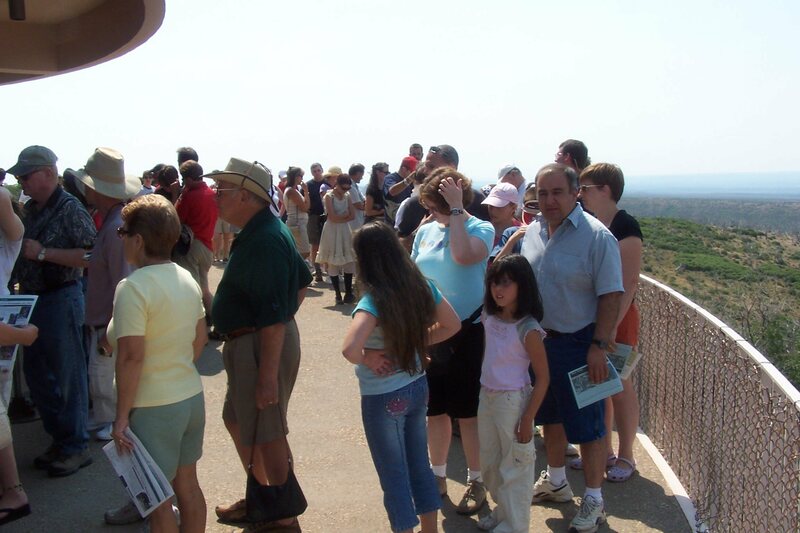 The long line was to get tickets to the more popular tours. Most of the areas open to visitors require a ticket; only Spruce House does not. Guess where we chose to go? There are two main mesas to see. Wetherill Mesa offers Step House, Long House, Kodak House, and Nordenskield Site #16. 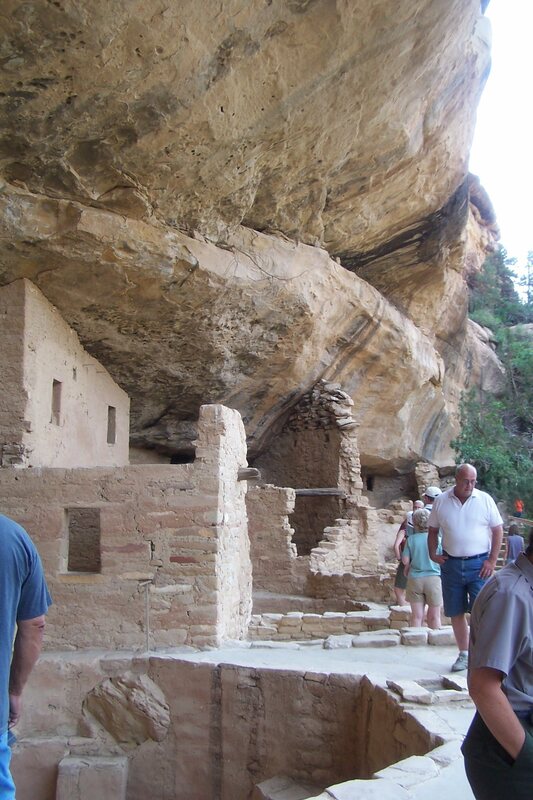 All visitors must park and board the tram, which makes frequent stops to see cliff dwellings and pit houses. Chapin Mesa has more to offer visitors, including Far View sites, Cedar Tree Tower, Spruce Tree Terrace (with food and a gift store), Chapin Mesa Museum (information and bookstore), Cliff Palace, Balcony House, and many pithouses and trails. Visitors may drive all over Chapin Mesa. 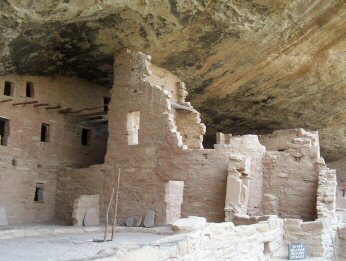 There are many turnouts to see cliff dwellings, in case you don't get tickets for a guided tour. Dedicated visitors can park and take hikes along many trails that lead down to the canyon bottom and up to other dwellings. It was a warm day in Colorado, with scattered clouds and hazy views. I'd hoped for a good picture from the Far View visitor center, but the haziness robbed detail from the distant canyons. I liked how they set up the visitor center - there was a good parking lot across the road, and visitors could safely travel in a tunnel lthat ran underneath the road. The problem with this National Park, as with many others, is that there simply wasn't enough room. There was enough land surrounding the visitor center, but the building itself seemed cramped and small. Yes, there there a lot of people there, but even taking that into account, I thought the NPS could have built a bigger building. There was no easy wandering inside; the crush of people made it an unpleasant experience. I got my refrigerator magnet, my Mesa Verde stamp and my Yucca House stamp, and got out of there. The rest of the family wisely took a look at the Center, and went back outside. Now, we had driven up this day from the town of Aztec, site of Aztec Ruins National Monument in northern New Mexico. It was a pretty drive, actually, and I was glad we came. But you have to realize that we were on the last day of a long 6-day driving vacation, and you ought to know that this was the fourteenth or so archaelogical NPS site we'd seen, the fifth on this trip alone. And we'd seen cliff dwellings before, at Canyon de Chelly National Monument, Montezuma Castle National Monument, Navajo National Monument, Tonto National Monument. So, while Mesa Verde is impressive in its sheer number of cliff dwelling sites, it wasn't as if we'd never seen anything like it before. 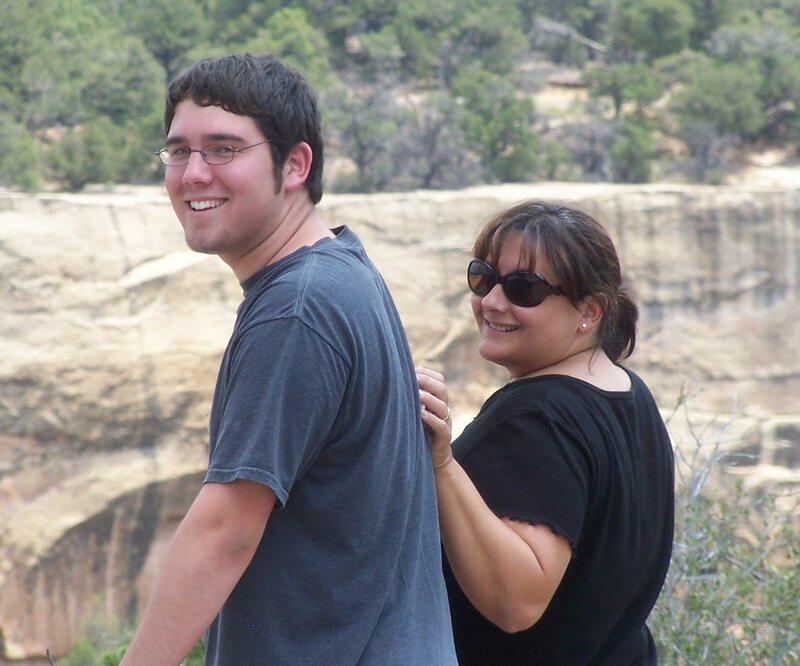 I convinced my family to drive along the path and stop at two or three places, where we could look out across a canyon and see a dwelling hidden under an overhang of rock. Sometimes I'd wonder, did they really let their kids run around and play there, close to the precipice? And did they really climb straight up the sheer sandstone cliffs when they needed to get atop the mesas? Apparently so, though there is a lot we don't know about their daily life. We stopped by the side of the road and had lunch, which everyone ate with good grace, and as the kids listened to their iPods or played on their GameBoys, I stopped at several pithouses to take pictures. The pithouses were underwhelming, but now that I've had a chance to read the pamphlets, I realize that the pithouses developed into the kivas we have come to know so well. That's pretty interesting. Overall, we came away a little underwhelmed, for a combination of all of the above reasons, I think. But they buildings were good, the NPS people were great as always, and I got the first Colorado stamp in my book. Hooray! From Durango, go west on U.S. 160 for about 30 miles. There is a well-marked exit that leads you directly to Mesa Verde, on your left (to the south). Yucca House National Monument is about ten miles to the west. The edge of Glen Canyon National Recreation Area is about 100 miles to the west. Hovenweep National Monument is about 20 miles to the west northwest. 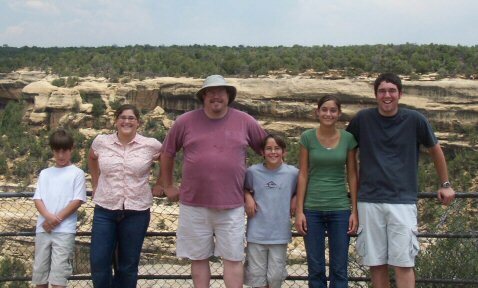 Natural Bridges National Monument is about 80 miles to the west northwest. Canyonlands National Park is about 85 miles to the northwest. Black Canyon of the Gunnison National Park is about 80 miles north northeast, and Curecanti National Recreation Area is just to its east. Aztec Ruins National Monument is about 30 miles to the southeast. Chaco Culture National Historic Park is about 80 miles to the south. 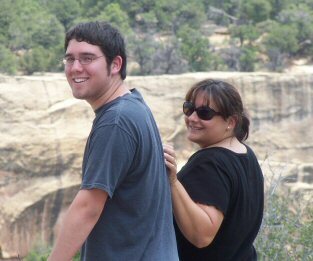 Canyon de Chelly is about 85 miles to the south southeast. Navajo National Monument is about 100 miles west southwest.